Going to France soon? The French have an undeserved reputation for being 'snooty' - especially in Paris. However, by making an effort to learn a few travel-oriented phrases before your trip, you'll be able to communicate well enough to discover more than a few French people who are exceptionally hospitable and willing to help. The best way to travel through France is generally by train. However, depending on where you are going and what you're doing, you may want to rent or take a cab. The following are a few phrases that can come in handy. The train is the easiest way to get around in Paris, the surrounding neighborhoods, and through France. It is relatively cheap, and most people use it to travel through Europe as well. The following phrases may come in handy. Est-ce que c'est le bon quai pour le train de. . .(Paris, Marseilles, etc.) eh-skuh say luh bohn kay poor luh trehn duh Is this the right platform for the train to. . .
Est-ce que la place est prise? eh-skuh lah plahs ay preez Is this seat taken? Je voudrais l'horaire. zhuh-voo-dray l'oorair I'd like the schedule. Je voudrais un billet en aller retour pour. . . zhuh-voo-dray uhn-bee-yay ehn-ah-lay ruh-toor poor... I'd like a round trip ticket to. . .
Je voudrais un billet en aller simple pour... zhuh-voo-dray uhn-bee-yay ehn-ah-lay sahm-pluh poor... I'd like a one way ticket to. . .
Où est le guichet? ooh-ay-luh-gee-shay Where's the ticket counter? Où sommes-nous? oo sum-noo Where are we? Quand part le prochain train pour kahn pahr luh proh-shehn trehn poor. . . When does the next rain for ____ leave? Quel est le tarif jusqu'à Paris? kell-ay luh-tah-reef zhuh-skah Pah-ree How much does it cost for a ticket to Paris? If you're not willing or able to take the train, a cab is your next best bet. You'll pay more, but at least you won't get lost. Additionally, most taxicab drivers, at least in Paris itself, speak some English. Combien est-ce que je vous dois? coh-bee-ehn eskuh zhuh voo dwah How much do I owe you? Est-ce que vous pouvez m'emmener à. . . eh-skuh voo poo-vay muh-muh-nay ah Can you take me to. . .
Je suis pressé(e). zhuh-swee-preh-say I'm in a hurry. Je voudrais aller à zhuh voo-dray ah-lay ah I'd like to go to. . .
Pouvez-vous m'attendre? poo-vay voo mah-tahn-druh Can you wait for me? Renting a car is generally only advisable for tourists who want to traverse the country. With that said, if renting a car is in your plans, the following translations can be helpful. Dois-je payer par kilomètre ? dwah-zhuh pay-yay pahr kee-lo-met-ruh Do I pay by kilometer? L'assurance est-elle comprise ? lah-soor-ahns et-ell cohm-preez Is insurance included? Où est le station-service le plus proche? oo ay luh-stah-see-ohn luh ploo prosh? Where is the closest gas station? Où puis-je prendre la voiture ? oo pwee-zhuh prohn-druh Where do I pick up the car? Quand dois-je la rendre ? kahn dwah-zhuh lah rohn-druh When do I have to return the car? Regardless of your business in France, you will need to eat while you're there. Something to remember is that tipping is strictly optional in France - it is completely acceptable to not leave a tip. Je vais prendre zuh vay prohn-druh I'll have. . .
Je vous écoute zuh vooz-ay-coot What would like (less formal)? Remember in France that you may need to request a bathroom and shower in your room if that's what you expect. It is not at all uncommon for guests to have to share a bathroom or walk down the hall to the showers. Avez-vous une piscine? ah-vay voo oon pee-seen Do you have a pool? Complet cohm-pleh There's no vacancy. Je voudrais être réveillé à six heures zhuh voo-ray eh-truh ray-vay-yay ah seez-ur I want a six o'clock wake up call. Je voudrais une chambre avec une douche dans la chambre. zhuh voo-dray oon shom-bruh ah-vek oon doosh dahn la shom-bruh I'd like a room that has a shower in it. Quelle est l'heure limite d'occupation ? kell ay lur lee-meet doh-coo-pah-see-ohn When is check-out? These phrases come in handy no matter where you are, or what you're doing. Combien coûte. . . cohm-bee-ehn coot How much does ______ cost? Je cherche. . . zhuh shairsh I'm looking for. . .
Où se trouve. . . oo suh-troove Where is. . .
Pouvez-vous m'aider? poo-vay voo med-ay Can you help me? 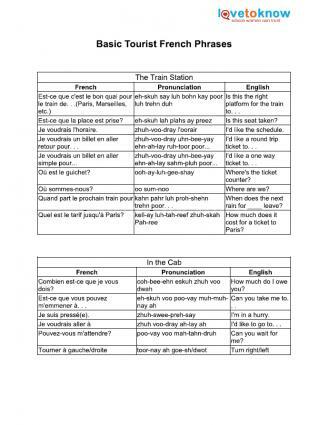 Useful Expressions in French for the English Speaking Tourist: The title is pretty self-explanatory and the phrases are indeed useful. If you can only purchase one thing and you want a book, this is the book to purchase. Rick Steven's French Phrase Book: This book, all in all, is pretty good for basic tourist phrases and is a little less pricey than the aforementioned selection. It is easy to use as well. The Electronic Phrase Book: If you'd rather purchase an electronic option, this is your best bet. If is very small, so it will fit well in your purse - and it will look like you're using your smartphone instead of looking things up! It is, of course, okay to dig out a dictionary to look up terms that you need help with. Generally, you'll find that the French are quite delighted when someone attempts to use the language, and will be very helpful.